So I often get questions along the same vein. People can’t figure out why there dog is good at one thing, and yet not good at another. He is a great dog in the house, but he pulls on leash. He heels on leash beautifully but he keeps stealing food off of the counter. 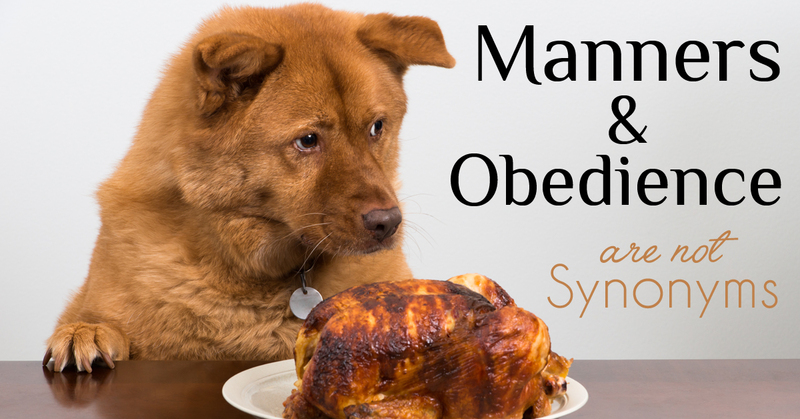 The irony is that manners and obedience are not synonymous to dogs. For people the words when used to describe dogs, they sound very much alike or almost the same but it is not like that for dogs. Ironically I have friends whose dogs have amazing, AMAZING obedience skills. These dogs have blue ribbons, trophies and numerous titles under their belt. But many of them have NO MANNERS. They will jump on you, they will steal the food out of your hand, they chase the cat and if you didn’t see them on the competition ring floor; you would never believe that they had such flawless obedience. A number of people who compete have numerous dogs, and as odd as it sounds to those of us who’s pets are our lives… their dogs are not pets. Many live life in crates or kennels except to come out to train, so they have never been taught manners. And some people take their dogs to obedience class; sometimes multiple obedience classes yet have no idea how to teach their manner-less dogs’ manners! They have invested sometimes hundreds if not thousands of dollars in obedience training (many of the times it is offered by one of those board and train facilities that dupe owners out of money) only to end up with a dog that still jumps on people, steals food, grabs underwear and does all kinds of things the owner wishes it wouldn’t. Just because a dog has obedience, doesn’t mean it has manners. It seems silly, it seems synonymous, but it isn’t to our dogs. They can heel perfectly next to you in the field but if you leave the steak out on the counter all bets are off. In his very small mind, it is totally different. I mean you taught him HOW to Heel right? He didn’t just bounce from the womb knowing that and leash manners? Yet sometimes we think dogs understand simple human manners, when nothing is further from the truth. Want Your Dog To Learn The Top 43 Most Important House Manners? Access my step-by-step collection of tutorial videos specifically guiding you through how to teach your dog the top 43 House Manners every dog should know. I would personally rather have a dog with manners than a dog with perfect obedience skills, if I had to pick one or the other (thank god you don’t have to choose) how awful would that be! Those and many, many more are forms of manners! It is not particularly fancy; not like a flip finish with eye contact and teaching your dog to walk backwards through cones. But it is probably more important. Ultimately good manners are what makes a good pet, and good manners usually keeps a dog out of the shelter. As humans we know we must teach our dog this flip finish and giving eye contact while walking backward through cones, but somehow we think this 12 week old puppy should know not to have accidents and know not to jump on people or steal food! In some respects I think “obedience training” is easier because we delve into it with the mindset of “dog training” or “puppy training“. Instead of these random expectations of manners, we need to realize that manners also need to be taught. And, unrealistic expectations often mean a lack of training. If I expect you to come in to work and do my job on Monday I probably am not going to train you, or at least not train you well. And, if I were to train you to do my job then I would probably ask you to come and cover for me; do you see some intricate details and differences? The good news is that it is a lot easier to teach your dog not to jump on the counter or steal food, or chase the cat or other simple manners. It is often more difficult to teach your dog to go turn on the light switch; yet both can be done with good training. 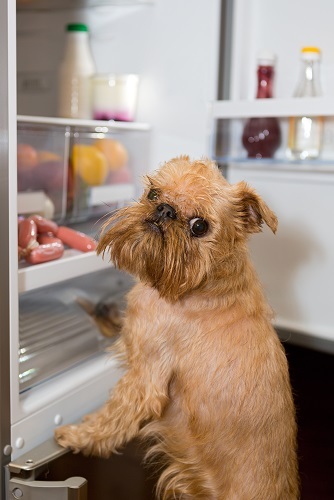 The tricky part of “bad manners” is that they can be somewhat self rewarding: stealing food from the counter, eating out of the cat box, running around with your stolen things can be fun to a dog. After all, he is a DOG and a different species with different social norms and ideals. So you must keep it from happening. The day my dogs come home be it from a breeder, a friend, a shelter, etc. I put a leash on them. A leash gives me control and a means of communication. I think we can all admit that chasing them and screaming does a lot of nothing to change the situation. Chasing them and screaming can actually be fun for them and game like! They don’t necessarily know that you are playing the game until the horror of the correction finds the, but even up until that point they were having fun. Simply by letting my new dog or puppy drag a leash I know that I am not going to be complacent when it comes to his bad behaviors. I have a way to stop them almost immediately. It takes that “funness” wind out of their sails. So the next time they see your underpants and think about stealing them again (yes you should put your clothes away!!!!) they reconsider it because the night before you didn’t even play the game you just put your foot on the leash and stopped his rambunctious run immediately. It wasn’t fun enough to even try again! (manners learned right?)! It may take a couple more times but that is the gist. If he is on a leash and he goes to jump on the counter, you won’t tolerate it, you will pluck him off, if he starts to chew your furniture you will pull him away, if he squats to go potty, you will take that leash and get him outside. Leashes and following your dog around the house monitoring his normal chosen behavior is how you teach a dog manners! For obedience invest in Chet’s Hands Off Dog Training program! I’m excited about trying the “house leash” (dragging the leash) with my dog, but what do I do when she’s attached to the loose leash and begins chewing on it because I know she will do so. Thank you. George is a passive dog almost all the time.he does not chase Ollie the cat. When he is introduced to a new person he sometimes jumps up. But we are correcting that move, slowly but surely. It’s true, but difficult to instill manners when you have very little time to spend with your puppy or dog. Potty training is much easier when one spends at least 8 years with him within sight. If one has a tight work program out of home, dog training is virtually impossible. How do we do it then? My three-year-old Yorkey is a pretty good dog her only problem is that she barks at other dogs she has it actually has a fit when she sees another dog. She’s a farm dog and has the run of the farm but when we take her somewhere she’s protecting us how can I stop her barking? 8 years to potty train is crazy! If you are consistent 8 days or less is sufficient. My pup Tristan got it in 1 day, but he is really smart. You can take a long weekend. Leash your dog to your belt and remember if there is an accident it is YOUR fault for not paying attention to your dogs signals. Potty them after playing, after they wake up, after eating. Go to their favorite spot or you can get those stakes that have pheramones in them if you need them to go in a specific spot. Praise as soon as they go and give a yummy treat like tuna/mackeral/chicken, etc. Don’t play when going outside to potty, they can forget why they are out there and then come in and go potty. Crate if you have to leave them, never use crate to punish. If not used to a crate, get pen panels or baby gate and put in a small room with easy to clean floor. A crate is better because it is smaller and they won’t want to soil it. Good luck, you can do it! I am finding the limited training periods far easier than I thought. I dedicated 5 minutes in the morning, during my lunch, and after dinner to beginning the clicker and leash training and it is working well. I find that the 5 minutes fly by and before I know it we have been training and having fun for far longer. All obedience dogs do not live in crates & have bad manners. My dogs don’t live in crates & all have obedience titles, with scores of 199 1/2 out of 200 with retrieving, jumping over hurdles, etc., and they love it. They have a smile on their face the whole time they are competing. All they are well mannered at home. I start puppies like you suggest, with a long, thin cotton clothes-line dragging from their collar. Makes it easy to step on in a hurry. But I have also had adopted dogs at age 7 that I taught all these same skills to. No screaming involved. And they are all my pets, my fur babies & best pals. I never meant to imply “all” but I am sure you have seen those I refer too. I also compete and my dogs have manners and obedience with excellent scores as well. Every time I read one of your articles, I learn something. I have two terrier mix shelter rescue dogs. I work and spend as much time as I can with them. Every little tip helps! Thanks so much. “Leashes and following your dog around the house monitoring his normal chosen behavior is how you teach a dog manners!” You should never leave a leash on your dog when he/she is alone — it’s dangerous to the dog (they can get caught, hurt themselves, even hang themselves). So, if you’re home and following the advice, you would always be monitoring your pet when on leash and therefore right there to immediately remove it from his/her mouth. Giving your dog an alternative appropriate chew toy or item (i.e. Kong filled with something yummy would be helpful in keeping the dog from turning to the leash to chew out of boredom. Having a dog is a commitment, just like having children. If you don’t have time to commit to raising them properly, it’s probably not a good idea to get a dog — it certainly isn’t fair to the dog. After all, dog people know that dogs learn to love us unconditionally and want to please us. Why would you not be willing to devote yourself to giving them a good reason to do so? what to do when our little taco dog doesn’t come to the command COME, just runs further we haven’t had him long , he’s adopted, 2years old, lost him a couple of times.with his running, he has a big fenced in yard,treated like a king. My Josie, was left on our doorstep a literally starved to death, covered in mange 6mnths pit bull weight 23 lbs. After 2 weeks at vet, we recovered a puppy! Josie has had social problems eating near or by our 2 small dogs, where she will attack in order to get the food. I understand after her starvation. Josie is now 1 1/2 years old. I feed her separately in the bathroom, while I feed the chihuahua and mini- dachshund in another room together. But even I can not touch her, nor her bowl while she eating. Anything I can do? I have worked with many starved dogs that are not resource guarders. This is a behavior problem. I would crate and feed them all in their crates. My dog (a medium dashund mix) is very rude and inconsiderate to me when I take her out. She pulls the leash, she sniffs all other animals feces, she marks other dogs’ feces, she walks all over the place, she refuses to walk when I tell her to keep walking and disregards that I have her best interests. She tests my orders and every time I take her out its a power struggle. On the contrary, when my husband takes her out, she can walk and move along normally. I have to keep trying to control the dog from ripping my arms out of the socket, or to not sniff other dogs exrement. She never waits for me patiently when I open the door but runs on and pulls. I have tried to educate her but she refuses and insists. My husband does not train her properly at being considerate and I have told him countless times she needs to learn manners and everytime he takes her out, he puts on his headphones and zones out, so she is very happy when he takes her out because she gets to do whatever she wants. My frustration is over the roof both because the husband and dog refuse to learn or use manners. Often times in the street people ask me if she’s a puppy. And I get strangers telling me to walk, just like all other people do. I feel embarrassed but she really tests my patience. I’m sure the neighbors think i don’t like the dog, but the truth is that when we are in public, this is when she decides to act up and will then freeze up so she doesn’t move. She’s dramatic in the streets but in the house she knows she must be obedient so she does what I tell her. I have felt like crying knowing that my dog tests my power like this and worse that she doesn’t love me enough to be respectful and obedient. She’s now over 2 years old but insists to everyone that she’s still s puppy and can act anyway she wants. She’s a rather small to medium sized dog, but she’s still very strong for me to manage when she pulls. I have arthritis, so sometimes I just can’t walk so fast. Very rude and inconsiderate animal. I would suggest a metal leash. I have a 25′ metal line I put my pup on (80lb German Shepard) when I’m out gardening in the yard (which isn’t fenced in). They have smaller and shorter lines available too. I also just made my heavy chewer an “unbreakable” chew toy, which is really just a lanyard made out of rope. Look up “Lanyard knot” or “Crown knot”. I bought $10 worth of nylon rope and it made me two toys that are about 2′ long (100′) just need to attach a clasp to the device and voila! I wish you luck! Man, I so wish I had started this sooner with my dog. A leash will definitely help, but we didn’t do it when he was a puppy, and now he is upwards of a hundred pounds. So a little more difficult with the size issue! And he doesn’t have any manners at all. Jumps on us, steals food out of the BABY’s hand (biting the little one in the process!) and does NOT walk on the leash nicely, chews shoes, EATS shoes and hair things and socks; anything he can find. Very naughty. He is well crate trained, though. And NEVER goes potty in the house (even urinates on demand outside). But that’s all we managed without the leash method.